One of the favorite activities is the Cake Walk! Each child will get one turn at the Cake Walk with their wristband and then their hand will be stamped. If they would like another turn they can do so by using a purchased food ticket. Thanks to everyone who has signed up to bring individually wrapped baked goods. See below for details about what to bring. For those bringing treats for the cake walk we had great success with the individual treats last year opposed to the whole cakes we've had in the past. More winners, and less to carry around. 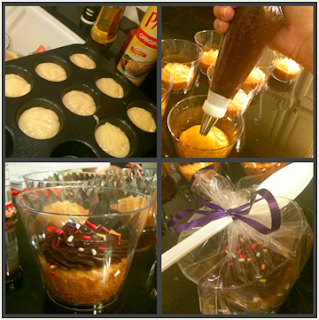 Bake the cupcakes in a greased muffin tin WITHOUT a paper liner. Pop them into plastic cocktail cups, then frost, place inside a baggie and top with a ribbon & spoon. chocolate covered strawberries, or fresh strawberries with whipped cream. Treat bags also work great too! 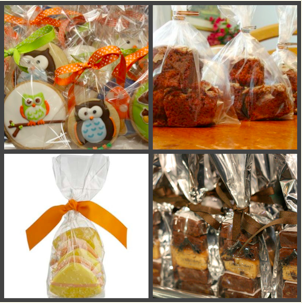 Just put 3 stacked cookies or a giant brownie or big rice crispy treat in a treat bag & tie with ribbon. It might even be nice to offer a healthy option. Lots of kids love mixed fruit cups (strawberries, blueberries, bananas, etc). 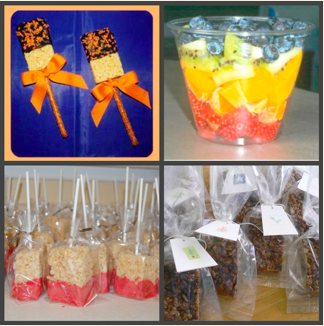 We are asking that each class provide at least 2 dozen individually-wrapped treats. Please bring them to the Multi-Purpose Room anytime on the day of the Hootenanny. Katlyn Haus is the Cake Walk Coordinator and can answer any questions you may have regarding this booth. ***Please label your treats! And follow district guidelines while preparing treats at home. 2. The following safe food handling guidelines are suggested when preparing the above foods for school activities. These procedures will be available to all parents and guardians, staff and parent organizations in order to promote the safe preparation of those foods. a. Wash foods that come in contact with the ground when growing or harvesting such as apples, melons, berries, grapes, tomatoes, lettuce, and so on. b. Wash hands frequently during preparation and always after using the restroom. Keep hands away from the mouth and nose during preparation and always cover cuts and scrapes so as not to expose them to the food. c. Make sure to sanitize all preparation surfaces and utensils with a mild sanitizing solution. d. Do not use products from damaged or bulging cans. e. Hold all cold foods at less than 41 degrees and all hot foods at greater than 150 degrees Fahrenheit to avoid the “Danger Zone” where bacteria have the opportunity to live and multiply. Reheat all hot foods to 160 degrees Fahrenheit before serving. Cool foods promptly in the refrigerator uncovered and not at room temperature. Food can be transported as long as exposure to the “Danger Zone” is limited. f. Don’t thaw foods at room temperature. Always thaw frozen foods on the bottom shelf in the refrigerator, in the microwave or under cold, running water in less than one hour. g. Avoid bringing homemade food to school if any member of the household has had an intestinal illness or traveled out of the country during the previous two months. h. The district’s safe food handling procedures will be available to these organizations and sponsors to provide information on the appropriate steps to safeguard the health of pupils, staff and community. 3. Drinks brought from home should adhere to the District regulations regarding carbonated sodas. Milk brought from home needs to be properly chilled. 4. It is the responsibility of the pupil’s parent/guardian to notify the teacher and site principal of any food allergies their child may have and what precautions are required to address their needs. In the event individual school sites allow food to be provided to pupils for school functions, the school site needs to implement a program whereby the organizing parents/guardians are made aware of the unique needs of the pupils in the classroom. 5. In order to support traditional school events such as Thanksgiving Feasts and International Celebrations (of which ethnic foods are sometimes the highlight of the event), a parent or guardian must provide explicit permission to participate in the event. The announcement of the event should include a listing of the foods that will be provided from home.